The oral cavity is the primary site of verbal human communication. It has many additional important functional roles, including bolus preparation and formation, taste, and deglutition. Oral cavity cancer treatment, particularly for advanced tumors (because of radical surgery), destroys the integrity of this area. Extensive reconstructive efforts are required to maintain oral continuity, to facilitate swallowing, to prevent aspiration, and to preserve satisfactory speech. Further, proper planning is necessary to hopefully gain a satisfactory reconstruction in a single stage. In addition, adequate tongue mobility and oral sealing with adequate sensory innervation are required. 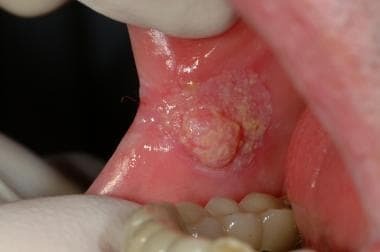 Early oral squamous cell carcinoma in the buccal mucosa arising from a chronic candidal leukoplakia in a person who smokes heavily. The lesion was a painless, chronic indurated lump. Cancer of the floor of the mouth can have devastating sequelae. It usually begins as a small asymptomatic nodular or ulcerative lesion, which may be overlooked. Because of its nature, ie, a painless lesion usually located in a hidden area, many patients are diagnosed at an advanced stage, when the lesion becomes painful or causes functional impairment. Head and neck cancers constitute 15% of all cancers of the body, with an incidence of 9.5 cases per 100,000 in the general population. Malignant tumors of the oral cavity account for approximately 30% of all head and neck cancers and for 5% of all cancers in the United States. Cancer of the floor of the mouth accounts for 28-35% of all oral cancers. The worldwide incidence varies greatly. Although cancer of the floor of the mouth accounts for 5% of all cancers in the United States, it accounts for 50% of all cancers in India. This difference is the result of cultural variations and habits (eg, excellent oral hygiene in the United States and betel chewing in India). Oral cavity cancers are more common in males, with a male-to-female ratio of 3-4:1. Although malignant tumors of the floor of the mouth develop most commonly after the fifth decade of life, they are not uncommon in younger persons. Tobacco and alcohol have additive effects on oral cancer. Tobacco includes smokeless tobacco derivatives, such as snuff and betel nut. In India, tobacco is blended with slaked lime and rolled in a betel nut leaf to form a quid, which is called a pan. A common practice is to hold the pan against the buccal mucosa for prolonged periods, leading to a mild euphoric state. The prolonged and repeated exposure of the oral mucosa to tobacco smoke, alcohol, and other irritants has been proposed as a principal cause of cancer. Smoking and alcohol consumption have a linear dose-specific relationship with oral cancer. The consumption of 40 or more tobacco cigarettes and 7 or more ounces of alcohol per day increases the incidence of oral cancer to 3-5 times that in controls. The addition of poor oral hygiene and poor dentition can increase the risk 8-fold. Some people seem to be more vulnerable than others to the effect of these irritants. The nature of the increased vulnerability may be genetic, familial, or acquired (eg, immunosuppression, syphilis, Plummer-Vinson syndrome, chronic candidiasis). These risk factors and the underlying pathogenesis do not disappear following surgical excision or radiation therapy for the cancer. The organs remain susceptible. If the patient continues to drink, smoke, and be exposed to other irritants, the risk of developing a second primary cancer increases to 15% within 5 years and increases to 40% thereafter. In addition, the rate of recurrence increases and the response to radiotherapy decreases. The head and neck region has rich vascularity, which is an advantage for treating cancer in this region. In addition, this vascularity increases the metastasis. The shells of tumors that metastasize to the head and neck are richer in vascularity than the tumor tissue itself. The most common presentation of cancer of the floor of the mouth is a painless inflamed superficial ulcer with poorly defined margins. Preexistent or coincident leukoplakia can be observed in adjacent tissues in approximately 20% of cases. The presence of erythroplasia strongly suggests an invasive tumor. A small ulceration or nodular lesion may remain asymptomatic for long periods, so the patient may not seek medical attention. Vague symptoms of soreness in the regional mucosa could be attributed to an aphthous ulcer. In fewer than 50% of cases, the ulcer is localized only to the floor of the mouth on initial presentation. If the tumor has grown with relatively few symptoms or if the patient has neglected its initial signs, the patient may first present with a neck mass, by which time the tumor has metastasized. Malignant tumors of the oral cavity grow rapidly, with frequent and early metastasis to the surrounding regional lymph nodes. Compared with the corresponding T categories, high T levels are more prone to metastasis. The incidence of regional nodal metastases at the time of initial clinical evaluation is 30-35%. Clinical symptoms are caused by growth of the lesion and invasion of deeper structures. The edges become more indistinct, and the base of the tongue and the lingual aspect of the alveolus may become involved. Referred pain to the ear (through the lingual nerve), halitosis, evidence of regional lymph node involvement, and bleeding are signs of advanced disease. A systematic examination includes inspection of teeth; labial, buccal, and gingival mucosae; tongue; and palate. The floor of the mouth is carefully examined using a tongue depressor to retract the tongue. Then, the floor of the mouth and cheek is bimanually palpated with a glove-lined finger to assess location, size, and extent of the primary tumor. Bimanual examination also allows assessment of the involvement of the structures of the submandibular triangle. The head and neck examination is completed with a direct examination of the ears, nose, and oropharynx and palpation of the neck. The dentoalveolar structures are assessed for the presence of gingival disease and the need for dental repair. If needed, the patient is referred to a dentist for treatment in order to minimize complications during surgery or radiation therapy. Close inspection of the external ears, the external auditory canal, and the tympanic membranes is then required. Exclude ear pathology in the differential diagnosis for referred otalgia. Squamous cell carcinoma spreads through the regional lymphatics. The primary lymphatic drainage of the mouth floor filters through the submandibular and submental lymph nodes (level I) and upper anterior cervical (jugulodigastric) node groups (level II). Examination of the neck should include both sides and all cervical triangles to detect regional lymphadenopathy. As described above, the submandibular triangles are palpated bimanually with a glove-lined finger. Selection of the treatment modality is based on an assessment of the patient's individual needs and the clinical judgment and experience of the physicians. Surgical resection or radiation therapy is usually effective in the treatment of stages I and II cancers. Either of these modalities alone is usually insufficient for stages III and IV cancers. Therefore, in most cases, a combination of the 2 modalities should be considered for the proper treatment of advanced cancers. Chemotherapy should also be considered in the management of large tumors when its addition may improve the results in organ-sparing protocols. To diminish the size of the lesion for a convenient operation, preoperative radiation therapy and neoadjuvant chemotherapy are considered in the treatment of huge masses. In any case, primary tumors should be treated radically, with a careful evaluation of the neck nodes. The floor of the mouth is a horseshoe-shaped hollow anatomic site of the oral cavity. It extends from the anterior inner aspect (lingual surface) of the lower gingiva and alveolar ridge of the mandible laterally to the insertion of the anterior tonsillar pillar into the tongue. It is medially bounded by the free inferior surface of the tongue. Its concavity is crucial for efficient swallowing of saliva. Anteriorly, it is divided into 2 halves by the lingual frenulum. Additionally, the papillae sublingualis and plica sublingualis are located in this concave region, which is covered by a mucous membrane with stratified squamous epithelium. Two major salivary glands are under the mucosa. Sublingual and submandibular glands drain into the floor of the mouth via the Bartholin duct and the Wharton ducts, respectively. The latter is about 5 cm long and courses between the sublingual gland and the genioglossus muscle. Its orifice is in the anterior floor of the mouth near the midline on the papillae sublingualis. On the midline, genioglossus and geniohyoid muscles separate the sublingual glands. The sublingual gland has several minor openings in addition to the Bartholin duct on the plica sublingualis. The sublingual veins are under the pink and transparent mucosa. The genioglossus muscle, geniohyoid muscle, mylohyoid muscle, and the anterior belly of the digastric muscle form the muscular diaphragm of the mouth floor. The lingual nerve, a branch of the posterior trunk of the mandibular division of the trigeminal nerve, provides sensation to the floor of the mouth. The arterial supply comes from the lingual artery, a branch of the external carotid. The regional lymphatics (level I) include the submandibular and submental lymph nodes, which lie inferior and lateral to the mylohyoid muscle in proximity to the submandibular gland. The use of radiation therapy as a primary modality may be contraindicated in tumor beds that have been previously irradiated, in tumors with mandibular involvement, and in areas with a history of poor wound healing. Quality of life is the most important goal. Consider reconstruction for all patients who undergo resections of the mouth floor for cancer unless a major contraindication for general anesthesia exists. A poor prognosis does not necessarily exclude a patient from reconstruction, although it may influence the techniques used. The more sophisticated reconstructive surgeries, such as a composite free flap, can also be performed in conjunction with radical resection. La'porte SJ, Juttla JK, Lingam RK. Imaging the floor of the mouth and the sublingual space. Radiographics. 2011 Sep-Oct. 31(5):1215-30. [Medline]. Dequanter D, Lothaire P, Bourgeois P, Flamen P, Lemort M, Andry G. Sentinel lymph node evaluation in squamous cell carcinoma of the head and neck cancer: preliminary results. Acta Chir Belg. 2006 Sep-Oct. 106(5):519-22. [Medline]. American Joint Committee on Cancer. Lip and oral cavity. AJCC Cancer Staging Manual. 5th. Philadelphia, Pa: Lippincott-Raven; 1998. 29-34. Kobayashi W, Kukobota K, Ito R, Sakaki H, Nakagawa H, Teh BG. Can Superselective Intra-Arterial Chemoradiotherapy Replace Surgery Followed by Radiation for Advanced Cancer of the Tongue and Floor of the Mouth?. J Oral Maxillofac Surg. 2016 Jan 8. [Medline]. Xu ZF, Shang DH, Duan WY, Liu FY, Li P, Sun CF. Free posterior tibial artery perforator flap for floor of mouth reconstruction: a case report. Microsurgery. 2011 Nov. 31(8):659-61. [Medline]. Lopez-Cedrun JL, Andres de Llano J. A 22 years survival and prognostic factors analysis in a homogeneous series of 64 patients with advanced cancer of the tongue and the floor of the mouth. J Craniomaxillofac Surg. 2015 Apr. 43 (3):376-81. [Medline]. Saggi S, Badran KW, Han AY, Kuan EC, St John MA. Clinicopathologic Characteristics and Survival Outcomes in Floor of Mouth Squamous Cell Carcinoma: A Population-Based Study. Otolaryngol Head Neck Surg. 2018 Jul. 159 (1):51-8. [Medline]. Zirk M, Safi AF, Buller J, et al. Lymph node ratio as prognosticator in floor of mouth squamous cell carcinoma patients. J Craniomaxillofac Surg. 2018 Feb. 46 (2):195-200. [Medline]. Lanzer M, Gander T, Lübbers HT, et al. Preservation of ipsilateral submandibular gland is ill advised in cancer of the floor of the mouth or tongue. Laryngoscope. 2014 Sep. 124(9):2070-4. [Medline]. Huntley SP, Davies M, Matthews JB, Thomas G, Marshall J, Robinson CM, et al. Attenuated type II TGF-beta receptor signalling in human malignant oral keratinocytes induces a less differentiated and more aggressive phenotype that is associated with metastatic dissemination. Int J Cancer. 2004 Jun 10. 110(2):170-6. [Medline].